Those who cannot be bothered with mastery over technology will find MyPCBackup an attractive option. 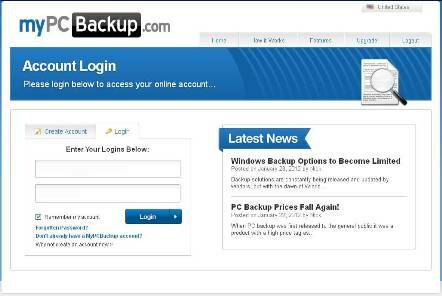 The Online backup tool created by the Hampshire, UK based company of the same name, is simple to install and even simpler to use. 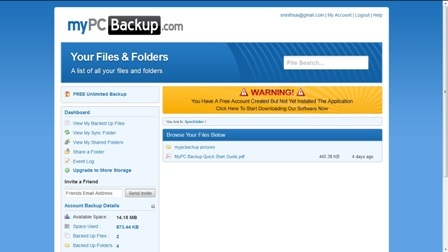 MyPCBackup is a recent addition to the cloud backup Industry. This Public Limited Company was established in 2010 by Daniel Richards with a clear agenda to create and deploy a Online backup tool that meets the needs of individual users with unlimited storage wants and limited budgets. The website almost screams out the fact that storage is unlimited (with a ceiling clause–on how much data can be uploaded per month–tucked into “terms and conditions”). The number of licenses that can be obtained by a single user is also unlimited. Users can sign up for multiple licenses for a single storage account. A free trial offering urges the user to give it a “try” before making the “buy”. The feature page on the website informs the user that the tool allows backup scheduling, versioning, automation, permits synchronization of multiple computers, and anywhere, anytime access to files and folders. Bandwidth throttling and idle backup are a definite “inclusive” in the feature list. 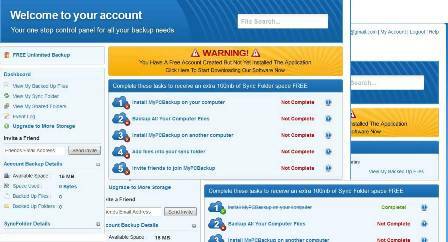 Any kind of computing device can be hooked on to the online backup account. Users of Windows, Mac, iOS/iPhone or Android will just have to download and install the automatically pre-identified, appropriate agent on their device. A Linux version of the software is in the pipeline. Backup of network drives is not yet permitted, however the website promises the introduction of Business plans in 2012 that will permit backup of network drives soon. User support is guaranteed via email, telephone, live chat, FAQ, Blogs, Knowledge bases or tutorials. A number of video tutorials are also available for those who like visual and guided support. While the volume of data to be backed up determines the time frame for initial backup, MyPCBackup claims that a user with a fast Internet connection can backup data at the rate of 3-4 GB per day. However, there is a restriction on file size for upload. The maximum size of the file that can be uploaded is 3 GB for all paid accounts. Users can view the files that are in the process of being backed up by accessing the account on the web from their PC or iPhone or they can view the status of the backup by accessing the agent interface installed on the device. File sharing and photo sharing features are enabled. Very large files can be shared. Files and photos can be restored by web download to another computer or to a physical media. However, FTP access is yet to be incorporated into the feature offering. Security is enforced by 256 bit encryption algorithms, which is sufficient to lay the claim of being bank grade. Data transfers are made over Secure Socket Layers to server farms for additional security, high availability and disaster recovery. While the pricing structure (costs decrease as the account subscription timeframes increase–$9.95 for a monthly subscription and $4.95 per month for a 2 year subscription) has a large bearing on the widening customer base, the company’s large footprint in the United States, the rapid growth of the company must be linked to the quality of the services customers get from the company. Any number of testimonials of good service can be obtained from discussion forums and Internet sites. However, the picture is not completely rosy. A quick look at the different forums or even the Company’s own FAQ page will show that there are glitches and problems—some technical and some non-technical—that users face while installing and using the software. This is likely to have been caused by the companies switch to Amazon S3 servers, a much more robust, secure, and larger Storage system. These are also the same storage servers as Dropbox, Something that can only be a positive. On the whole MyPCBackup is a definite recommendation for those who are not looking for sophisticated, ultra secure data backup solutions. Market Focus: To be the most feature rich online backup and cloud storage software company in the world. 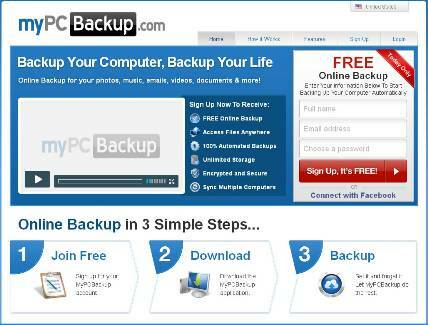 Positioning: “MyPC Backup is currently the fastest growing online backup service today. Leading the way with revolutionary technology and for-thought, MyPCBackup offers affordable solutions in an otherwise over priced market. Many competitors in the industry are stagnant, and do not wish to evolve with the ever changing demand for storage. 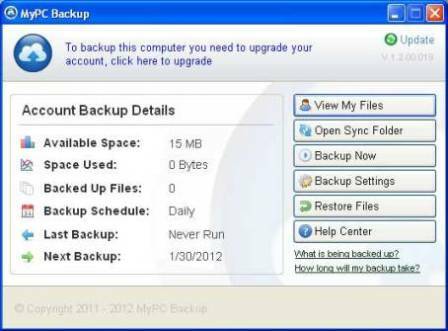 MyPCBackup now offers many incredible features that others simply do not”. * Low cost solution with a pricing model that attractively links subscription timeframes to per month costs. Registering for the MyPCBackup Registration is a three step process. Navigate to the home page of the company website and use the form available on the top right hand corner of the page to register. The user needs to enter only three parameters—full name, email id and password—to complete the registration. Once registered, the user is taken to the download page where the small 17.7 MB exe file can be downloaded. The web application automatically senses the operating system in use on the system and downloads the appropriate agent software. Agents are available for Windows XP/Vista and Windows 7; Mac OS 5. A Linux version of the application is on the pipeline and is expected to be released soon. A number of operating systems for handheld devices are also available. For the purposes of this review, we downloaded and installed the agent for Windows 7. 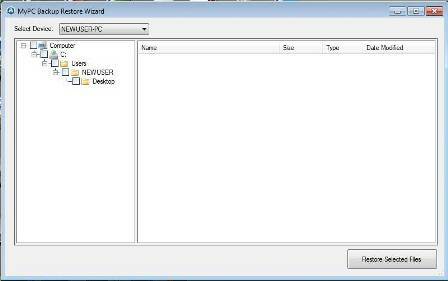 Double clicking the icon that gets deposited on the desktop initiates the installation wizard which guides the user through the installation process in a matter of minutes. On completion of the installation, the Login screen opens prompting the user enter the email id and password that were selected during the registration process. After login, the password or the email id can be reset by navigating to the change password or account details page on the website. Note that the screen contains a link to the “Forgotten Password” screen. Users attempting to access the account and its contents over the Internet after backup from a different computer can use the web browser based application for login and account access. The login screen gives access to the backup account details screen (please see screenshot below) displays all the relevant details of the user account—space availability, space usage, backed up files, Backup Schedule, Last backup and next backup. It also contains a number of buttons—View my files, Open Sync folder, Backup now, Backup settings, Restore files and Help center. While “View my files”, “Restore files” and “help center” buttons need an Internet connection to open the relevant page on the online account, “Backup Now” button is a command button that initiates a backup even if it is not scheduled to kick into operation. The Backup settings button opens another screen of the agent application wherein the user can tweak the backup settings. The Open Sync Folder opens a folder on the C:// drive that was created during the installation process. All files and folders marked for synchronization are deposited in this folder and later uploaded to the online Synchronization folder on the remote server. The application interface also provides two other links that are placed just below the buttons. The first link “What is being backed up” will open the online backup folder on the remote server and give the user a peek into the files that are currently being backed up. The second link “How Long will my backup take” takes the user to the FAQ page of the Company website. The online dashboard is only visible if the user logs in from a computer on which the agent has been installed. In all other instances, the user is returned to the login page even though the web application acknowledges and authenticates the user login and password and identifies the user. This rather defeats the purpose of the anywhere access feature of the cloud. The user will have to compulsorily download and install the agent software before the account can be accessed for viewing or bare metal restore of files. The dashboard provides an aggregated single window view on user account information. The page displays the number of licenses held by the user and the number of computers that connect to the account for synchronization of files and folder, the number of files and folders added to the synchronization folder, the status of the backup, links for additional license downloads, etc. The comparative screenshots presented below will provide the reader with a clear picture of the contents of the dashboard before and after events have been triggered. Every completed action is scored off, while pending actions are shown as incomplete, allowing the user keep track of all account activities. Users can upgrade to a higher storage by clicking on the relevant link on this page. 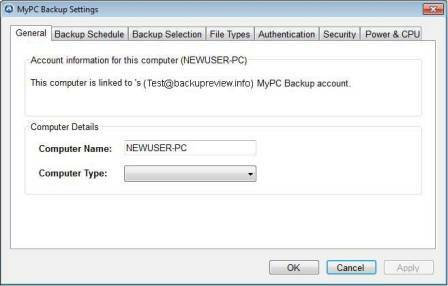 The “MyPCBackup Settings” screen is a tabbed screen with seven tabs named General, Backup Schedule, Backup Selection, File types, Authentication, Security, and Power & CPU. 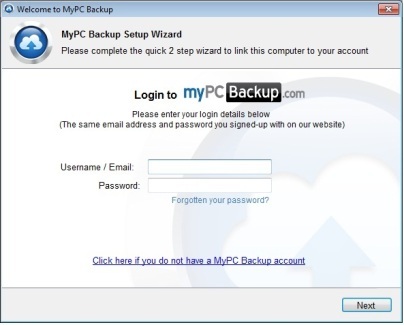 The General Tab informs the user about the PC on which the agent is installed and the email id through which the local PC is linked to the MyPCBackup.com account. The details—such as the name—of the local PC and the device type are detailed. The device can be a laptop, a handheld computer, a server or a PC. Users have the option of Scheduling Backups automatically on an hourly, daily or at a specified time schedule. They can also set the schedule to manual, and initiate backups as per their convenience at any point in time. 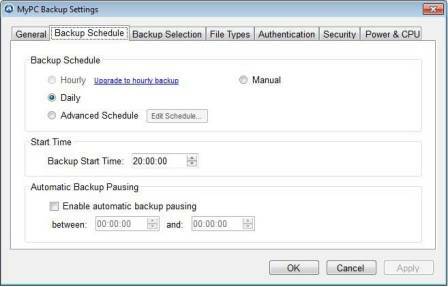 If automatic schedule is selected, the Backup start time and any automatic pause time can be prescribed. By default, the backup process backs up all the files available under “My Documents” folder. 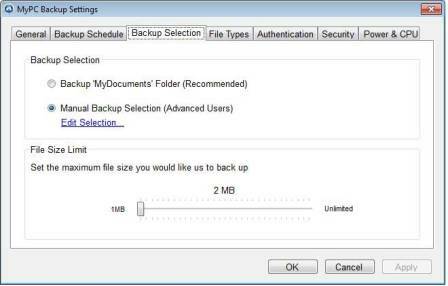 However, users can choose to create a specific backup set by selecting the “Manual Backup Selection” (Advanced users) radio button. 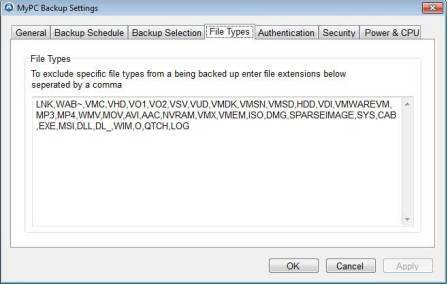 The files selected for backup can be edited at anytime using the “Edit Selection” link. MyPCBackup.com prescribes a limit on file size for upload. Paid accounts can upload file sizes of up to 3 GB. The trial version only permits a 2MB file size for upload as shown in the screen shot. The File Type tab allows users specify file types that must be excluded from the backup set. The file types to be excluded need to be entered into the text box in CAPITAL letters and separated by a comma. The Authentication Tab provides access to the Change password settings for the account. The Security Tab recommends that the user select HTTPS connection for upload of files. The alternate is the HTTP (without the “S”) setting which is faster but not so secure. The last tab—Power & CPU–in the backup settings screen allows users to configure the agent for power saving and optimization. 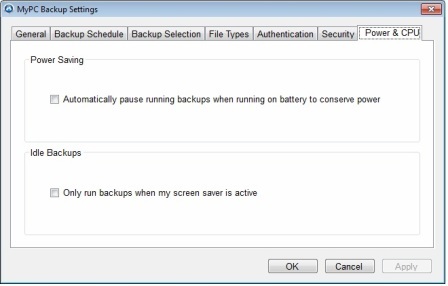 The backups can be made to automatically pause when the system is running on battery and to run when the system is idle. 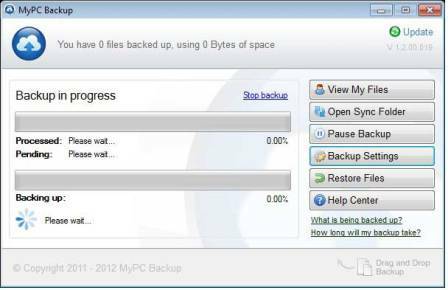 If the backup is set to automatic, the process will kick start as per schedule and will complete in the background without disturbing the daily event calendar of the PC being backed up. 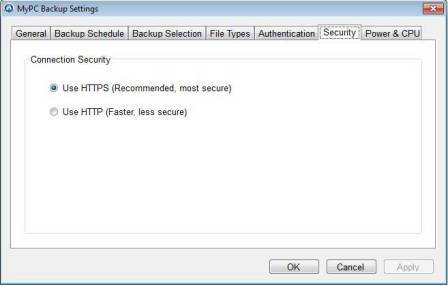 The status of the current backup can be ascertained from the Backup in Progress screen on the agent interface. The online dashboard sequentially lists all the backups done–per PC/laptop/server connected to the account–to date and indicates the status of the backup. A backup status can be failed or completed and the computer status can be online or offline. Users who need to confirm that the files have been correctly uploaded can use the online web browser based application via the Internet and view the backed up files. The online “View my files” can be accessed from the agent interface by clicking the button bearing the appropriate label. The files and folders in the online account are displayed in a fashion that is similar to Windows Explorer. Individual files can be opened and viewed or downloaded by double clicking on the file. My Sync Folder by default provides for 100 MB of space. Additional space can be requisitioned from the company with every upgrade of storage space. 5 GB, 10 GB and 20 GB Sync folder options are available. Files can be restored to any PC or computing device from the online account provided the agent is downloaded and installed on the PC or computing device. The user can click on the Restore Files button available on the agent interface to initiate the restoration. The files available for restore—Source wise—is displayed on a Windows Explorer like interface and users can download individual files on to the PC. There is, currently, no FTP download option available and downloading individual files can be a daunting task if the volume of backed up files is very large. 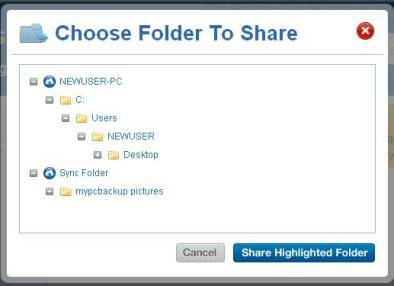 Users can share files and folders with other users by marking them as shared. Sharing of files and folders can only be done on the online web browser based application interface. Users need to login to their online account and navigate to the files and folders that must be shared and mark them as shared. Thereafter, it is only a matter of entering the email id of the friend or colleague and sending them the invite using the invite screen that pops up. 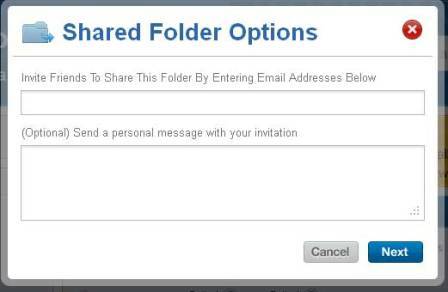 Note that once your friend or colleague ends the sharing session by closing the file, a fresh share invite will have to be sent if the file has to be opened again by your friend or colleague. 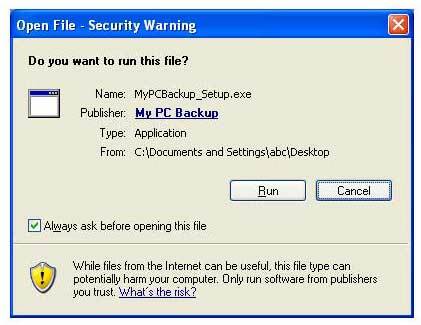 MyPCBackup harnesses the power of 256 bit encryption algorithms to secure the data that is transmitted from the computing device to the online server. An additional layer of security is provided if the user selects to transmit the data over a Secure Socket Layer (SSL). Support MyPCBackup provides multi-channel support to their customers. Users can contact the support team 24X7 over telephone or email. Additionally, the site has provisioned for a ticket system for registration of complaints. Users who feel the need for immediate attention, can avail themselves of the live chat facility that is made available on the website. The most frequently encountered problems have been addressed in the FAQs that are available on the site and accessible from the agent interface and over the Internet. An extensive knowledge base with video tutorials is available for those who are looking for more granular information on how to use the software and its features. The plus for this product is the fact that it is extremely user friendly and easy to install and ideal for the technologically challenged novice or the individual user with a few computing devices. While, multiple computing devices can be synchronized to a single online account, enterprises with large number of systems may not find the “best fit” solution that addresses their needs. They would perhaps be looking for something that is more robust and sophisticated. However, for the individual user and the home user, it is a secure and cost effective way of storing information even when the add-ons have to be requisitioned at an additional cost. There are not many advanced settings and features to grapple with. If the user does not want any sudden surprises, it is recommended that they check out all the plans and essential add-ons to get a fairly accurate idea of what the actual budgetary outlay required and what they are really committing themselves to. The “unlimited” storage option does not really come free. It has a price attached to it. Space availability is unlimited, but users have to pay a price for the usage of the space. The file size that can be uploaded to the account is “limited” and upgrades are available at a cost. 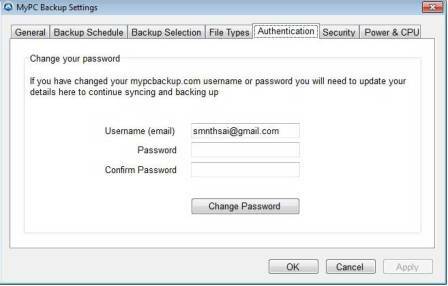 Mypcbackup.com is an unreliable backup service that does not backup files consistently to schedule and does not respond to support calls. I would stay away from this product. Great service and should be given more stars – if not for their mobile solutions and support team alone. 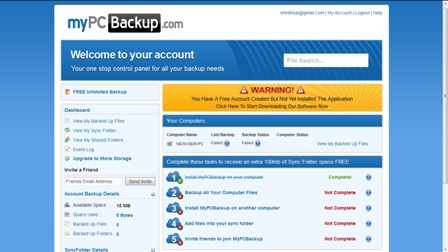 I wanted to share with you the experience I just had with myPCBackup.com because I think it can help all of you who are looking for an online backup website. Before to subscribe, I wanted to be able to have an unlimited backup (I have 900Gb of photo) and to backup my USB drive. I went thru the myPCBackup.com, and they offered both, and a 30 day money back guarantee. During the trial period of 15 days the speed was OK. Not too fast, but not too slow. Once I subscribed, the speed became very slow (about 5GB per 24 hours to upload). I contacted the technical support and they advised me to buy the “Supercharged” update to increase the speed, for $14.95. During 2 weeks after the update, the speed didn’t change at all (still about 5GB per 24 hours). I began to think that this is a scam. 10 days later, I couldn’t connect my USB drive any more to the backup. I got an error message from their software, inviting me to buy an upgrade. I contacted them, and they told me that they changed the terms of their service, USB drive is not anymore included, and I will need to pay an Add-on to my subscription to get it back. This was too much. They changed the terms of the subscription I contracted with them, without the agreement of the customer, which can, by the laws, in Europe, be a condition to breach a contract. So I invoked the 30 day money back guarantee as they cannot provide anymore the service for what I paid. They close down my account under my request. I had to wait almost a week and several emails to claim for my money to receive a refund of … $20.83. Which they explained that the 30 days money back guarantee is not for the add-on, and they applied some fees. So, my point is STAY AWAY FROM THIS COMPANY, IT’S A SCAM. They will try to attract you by spamming your mailbox with cheaper offers every days, and claiming that you have the 30 days money back guarantee. The service is very slow and they don’t respect basic commercial rules, as written to the customer before to make a significant change in the contract you have with them. They will cheat you again when it will come to apply their 30 days money back guarantee, and won’t fully refund you. To my surprise, the editor at OnlineBackupSpot.com decided to edit my comment. I have pasted below my original comment and I hope this website (BackupReview.info) doesn’t do the same and bring yet another shame to the industry. MyPCBackup, JustCloud, Backup Genie and ZipCloud are all owned by a company called Just Develop IT (JDI). JDI was created after the owners sold their web hosting company. JDI has been aggressively marketing their products online. Their marketing is a COMPLETE SCAM. JDI targets review sites like this one, and specifically ask the “reviewers” to rank the three companies (MyPCBackup, JustCloud, and ZipCloud) as the top three solutions in exchange for a high commission. If you put them at #1 in your rank, you get $175 for every sale. If you put them at #2, you get $150. If you put them at #3, you get $135 for every sale. If you put them at #4, you get $120 for every sale. If you put them at #5, … you got the picture … a Pyramid scheme. In addition to the top ranking positions, JDI also requests that the ranking must be VERY VISIBLE in the website (like a home page with the ranking stars clearly showing in their favor). Now you can see why so many “review” sites are selling their soles to the mighty dollar. What a shame!!! Whenever I see a “review” site, ranking any of these three JDI companies, I just run away as fast as possible. Do not support such a scam marketing by ranking MyPCBackup, ZipCloud, JustCloud higher. In my opinion, all JDI sites don’t deserve to be ranked even at #1,000. The Internet has created a lot of great opportunities, but at the same time, it has brought such a Pyramid scam in our lives; and the sad part is so called “reviewers” are pushing these sub-standard products on unsuspecting readers, with no guilt. JDI and all their products – MyPCBackup, ZipCloud, JustCloud, and BackupGenie are all the same garbage product just repackaged and priced differently. Everything about this company screams scam. They spend a lot of money marketing their worthless product and paying people to write “good” reviews, while providing lousy details about their product before you signup, and lousy support if you do. If you really had a great product, you wouldn’t need to use four different names to disguise what it truly is – crap. I know about them only because there is a popup on my computer that I am trying to remove. The popup takes me to their site. I can’t remove the popup, and I have no wish to use their service. From researching how to remove this popup, I have run across many reviews that warn that there are many hidden fees. As soon as you sign up, you find out that the service must be upgraded to work anywhere near like you think it should. Another common review is that the customer cannot cancel the service. You must send an email, and they will eventually cancel. I can’t wait to remove this miserable popup. Three days ago, I was unaware of this company. Now, I have only hate. Be careful of this company .. It is a scam and they will take your money very quickly but be very slow at returning it. Subject to how you respond to this, I will be bringing the financial ombudsman and trading standards into play. My pc backup popped up a couple of days ago and offered me a deal of £4.95 for 2 years with the usual price of £118.95 crossed through. I accepted and then discovered I’d been billed for £118.95 which is unacceptable. Within 15 minutes I had cancelled it yet yesterday the charge which allegedly had been voided was taken from my account and I am now being told that it will take 7-10 days to have the refund appear in my account. That is totally unacceptable and I will be taking you to Trading Standards and the Financial Ombudsman if it is not there by close of business today. As far as I am concerned, the funds were taken from my account without authorisation and therefore it is fraud resulting in theft. When you live off a shoe string as I do, being reduced to packet soup for nourishment because you can take money within 24 hours but not return if for up to two working weeks really is not acceptable!! PS My account hasn’t been totally closed down as it popped up again this morning .. I have no wish to have anything to do with a company who scams you so kindly ensure it is fully closed down. I agree about this company being a scam. It starts out simple, but then they incrementally ask for more as you keep running into unforeseen limits (didn’t initially backup external drives, file size limit, speed of upload). Also, MyPCBackup gets deleted by IObit Malware Fighter and Advanced SystemCare (it took me weeks to find this out – IObit was great in providing a fix – MyPCBackup was no help). I have 2.5Tb to backup up (most of it stable over time), so I bought unlimited, only to find out that there is really a limit (about 800Gb, buried in Section 14 of the fine print) and I was then encouraged/demanded to buy their “Business Plan” for about $30/month. I cancelled my service. We shall see if I get my money back. I used the service- MYBACKUP for a brief period last year. It was okay but I realized it wasn’t really needed. When attempting to cancel, the staff was pleasant although a little persistent about trying to retain me. Unfortunately, I still get calls every few months though from ( JUSTCLOUD I believe ) the company- very disappointing. Hopefully I won’t have to change my phone number.